November is almost here. Once again, in Virginia, nature provides our eyes with an awe-inspiring scenery of autumn leaves. The green pigment chlorophyll has dominated all throughout summer but when the days get shorter, carotenoids, mostly orange or yellow, and anthocyanins, mostly red, begin to emerge. Schools have nearly finished through one quarter. Carving pumpkins coincide then with parent-teacher conferences being held inside classrooms. This is also a time for parents to sit down with their child's teacher. It is an opportunity for parents and teachers to join their heads together and examine how a particular child, their child, is doing in school. A typical chemistry major would spend close to a total of 1000 hours of lectures and laboratory work in various chemistry courses. At the end, if the student desires to pursue graduate studies in chemistry, he or she may take the standardized Graduate Record Examination (GRE) in chemistry which takes about two hours and fifty minutes. The GRE chemistry exam is less than 0.3 percent of the total time spent on chemistry courses. 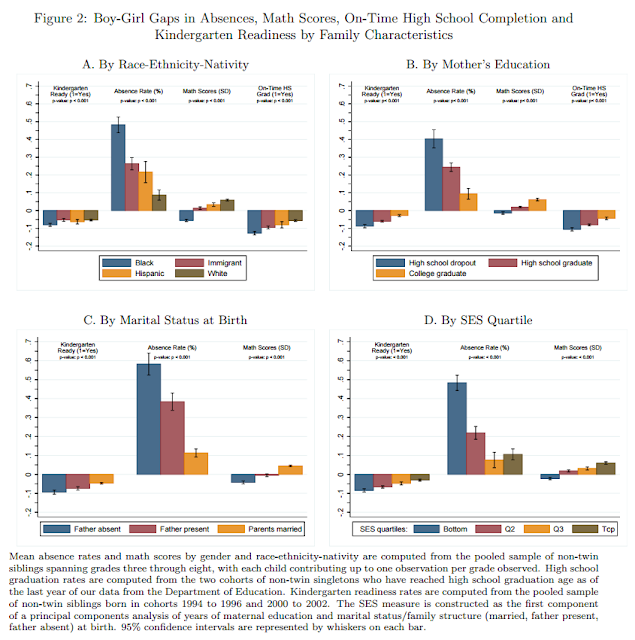 In stark contrast, elementary and high school students in the United States spend nearly ten times more on standardized tests. It is thus promising to hear the president of the United States proposing to limit the amount of standardized tests in basic education. The call from President Obama comes after the Council of the Great City Schools has released its report, Student Testing in America’s Great City Schools:An Inventory and Preliminary Analysis. Transparency is important for it provides information for the public about what their government is doing. Transparency promotes an informed citizenship that can then engage, collaborate and participate in governance. Governments make decisions, create programs, and draw policies. All of these actions require information that can be used to increase effectiveness and efficiency, as well as curb graft and corruption. 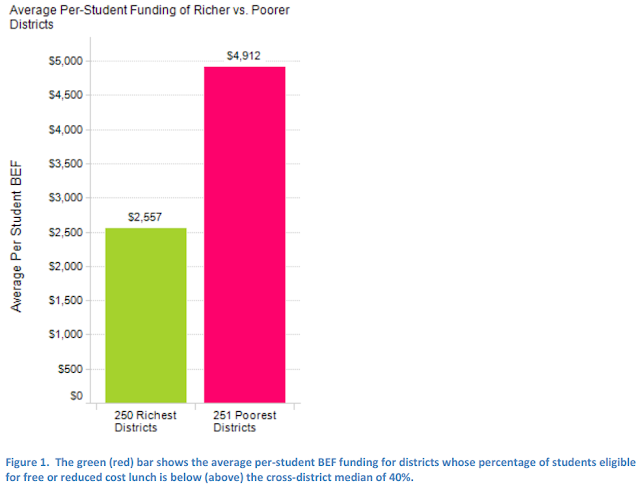 In basic education, data on funding is important. Funding is the direct link between taxpayers and the schools. Funding dictates how much resources are going to be made available in schools. Thus, funding connects data on education in various dimensions. When the public is provided with access to such data, public engagement is enhanced which can only help a democratic government in making quality decisions. Ten years ago, I held workshops for elementary school teachers in the Philippines. During that time, I sat down and had a casual conversation with a male teacher. He was not participating in any of the meetings I had scheduled for teachers, but he was quite eager to share with me what he nows about managing a classroom filled with young children. There I was, quite eager to share my ideas and yet found myself on the receiving end of experience. That dialogue was quite brief, but such encounter, in my opinion, was demonstrating to me in a simple but direct way what was necessary to uplift the teaching profession. 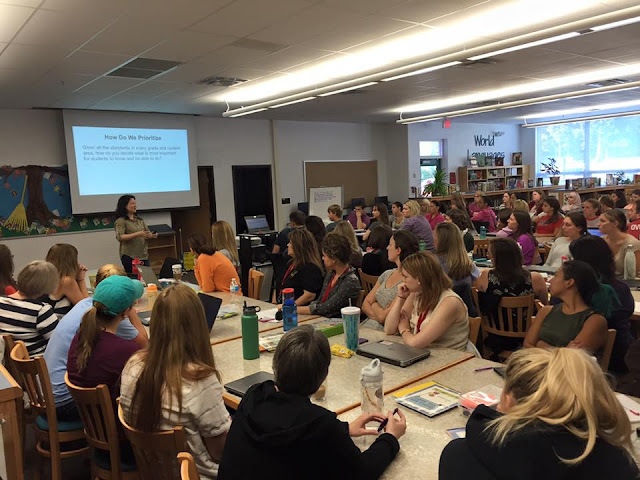 The previous article in this blog, A Seed Needs a Fertile Ground, illustrates by a specific example, how professional development and adult learning can happen inside a school. 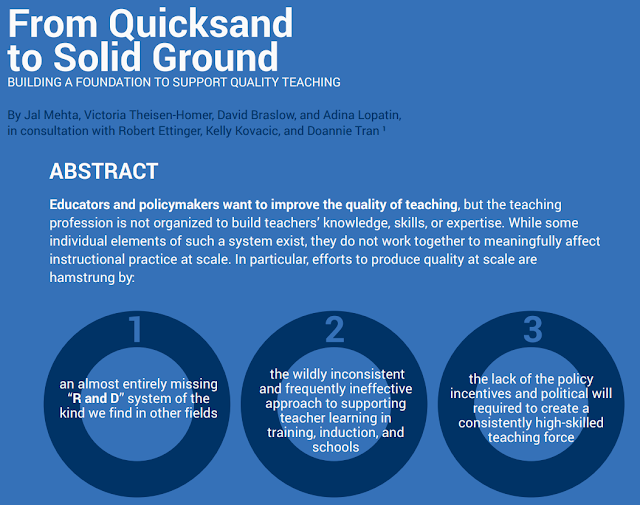 A recent white paper by Mehta and coworkers from the Transforming Teachingproject housed at Harvard University, offers a picture that broadly captures the main challenge in building quality teaching. The Commission on Elections has set the following dates, October 12 through 16 this year, for filing of candidacy. It is no surprise to see posts and news about candidates saturating both social and mass media. Among the candidates for vice president is Ferdinand Marcos Jr., the son of a former dictator. While in the Senate, Marcos Jr. in a press release stated the following, "the K to 12 program, which will add two years of schooling, is not an effective way to improve the quality of education in the country. Instead, raising the competency of teachers and upgrading educational materials are the keys to raising the quality of education of Filipino students." Micaella Serrano, a 16-year old student at Batasan Hills National High School, is now spending her nights and weekends against DepEd's K to 12. An article on the New York Times starts and ends with her story. The article briefly mentions the numerous legal challenges submitted before the highest court in the Philippines. Some of these petitions are based on lack of public consultation as well as the potential loss of employment and tenure for thousands and thousands of university employees. The main point of the article, however, is the view that the government is ill prepared for the new curriculum. DepEd's K to 12 requires a tremendous amount of additional resources. For a government that cannot even provide a decent ten-year basic education program, K to 12 really sounds like a disaster of our own making. 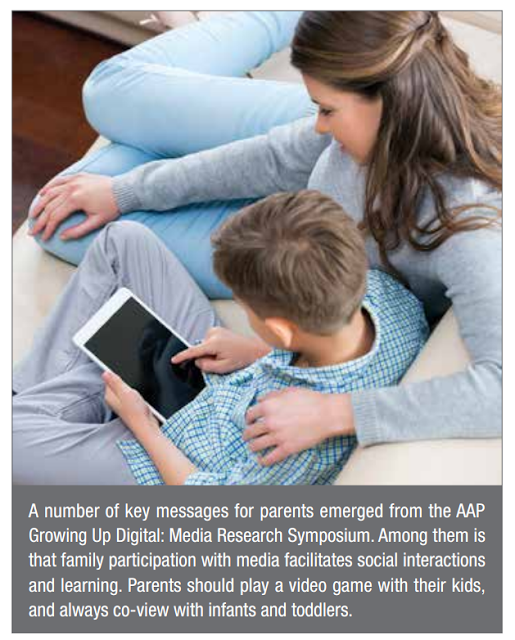 The American Academy of Pediatrics has recently posted an article on its magazine addressing the issue of how parents should manage their children's exposure and usage of technology at home. 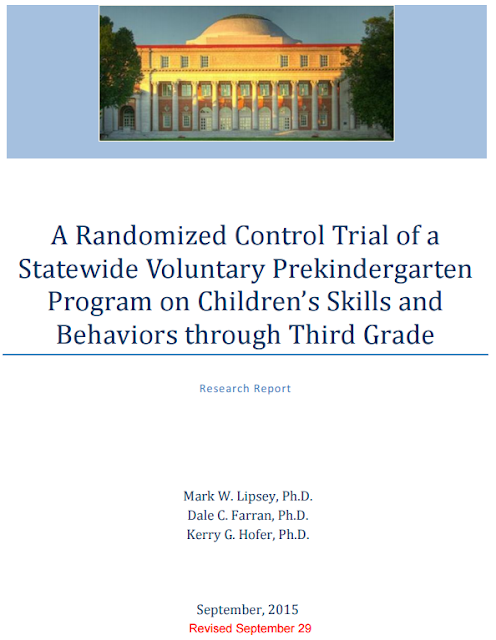 The themes explored in the article begin with the realization that with a device, children are actually doing the same things as in other environment such as playing, reading, communicating, or getting entertained. The main difference lies only in the medium. With a smart device, it is either purely virtual or merely online, not face-to-face. Thus, figuring out how much screen time is appropriate for children should be guided similarly as determining how much time should a child be allowed to spend in a playground, if the screen time is about playing. Are Public School Teachers in the Philippines Asked to Pass Everyone? There is a year-old open letter posted in the blog Definitely Filipino that has found its way once again in social media. 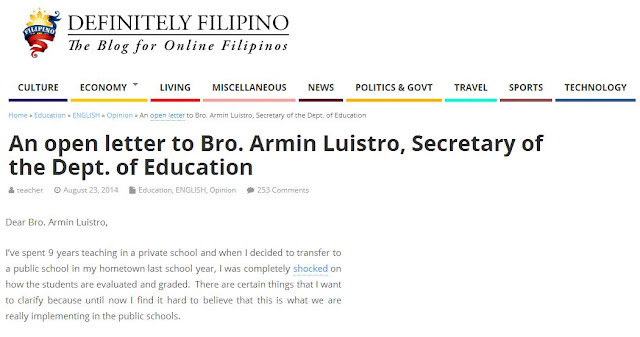 The letter is addressed to the secretary of education in the Philippines, Bro. Armin Luistro. Since the additional pay a teacher may receive depends on given measures, it seems that schools are tailoring its policies to game the system. For instance, performance based bonuses are fueling the need to keep dropout or retention rates in schools low. The letter therefore talks about the perception that mass promotion is encouraged in public schools in the Philippines. Obviously, there is inequity in society. 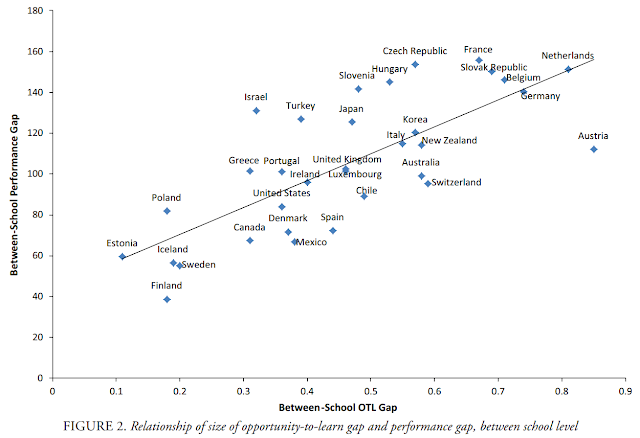 If such inequity also exists in education then the effects of poverty in schools are likely to be magnified. 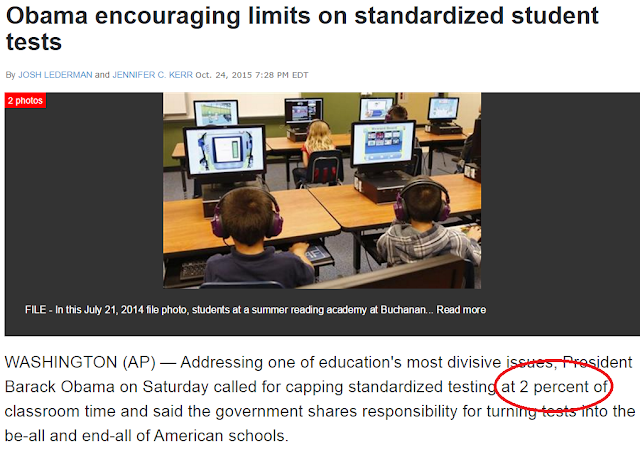 This unequal treatment can in fact start at the curriculum level. Children from affluent families can be given access to a richer and deeper instruction while those from poor families are provided less. This may sometimes happen in differentiated instruction, but is nearly guaranteed to manifest in academic tracking. 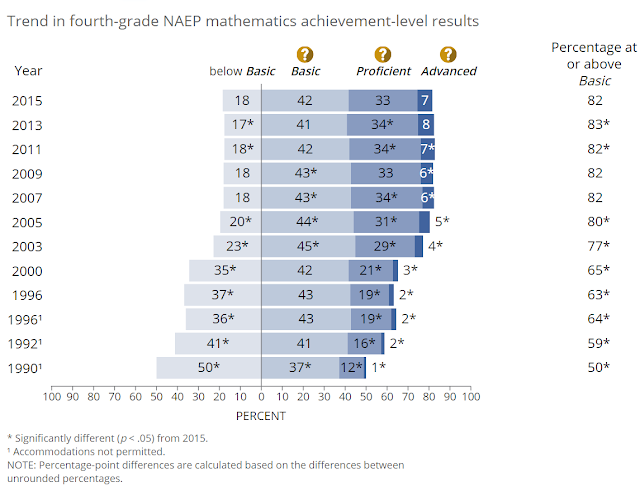 Differentiated instruction often aims at addressing the needs of a student thereby alleviating inequity. On the other hand, academic tracking is deciding the content and skills to be taught based on a perceived ability of a student. 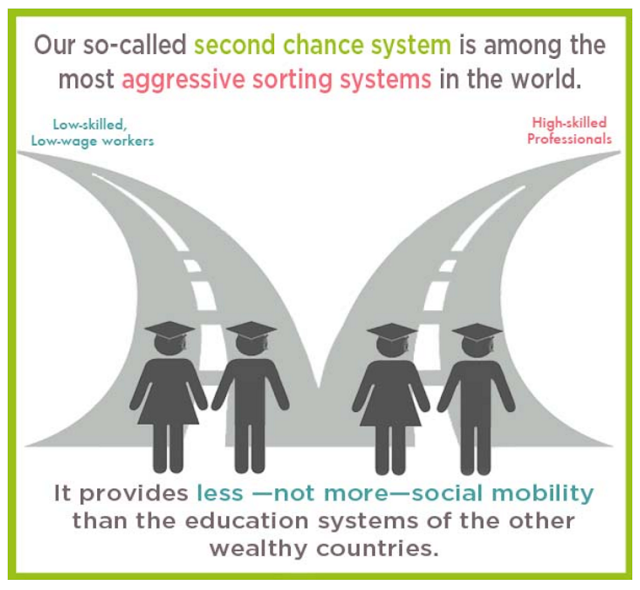 Students from poor families usually have weaker background preventing them to qualify for higher academic tracks. Actually, in the photograph below, Jesse Robredo is sitting on a sidewalk with other men barefoot. In wearing slippers or going barefoot, there is an obvious sense of humility. What should not be missed in this picture is that Robredo is sitting with other men. It is a humbleness that is rooted in recognizing that the challenges and victories in life are shared. Robredo's slippers need to be understood in the proper context of his ideal of allowing and encouraging citizen participation in government decision making. 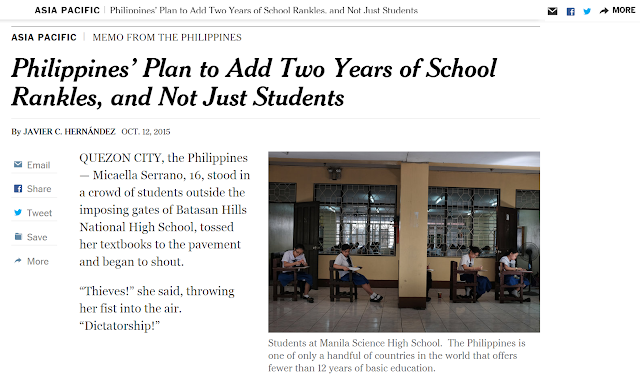 This ideal is best appreciated in Robredo's approach to solving problems in basic education. A teacher's intangible yet priceless reward is witnessing an appreciation from his or her pupils. 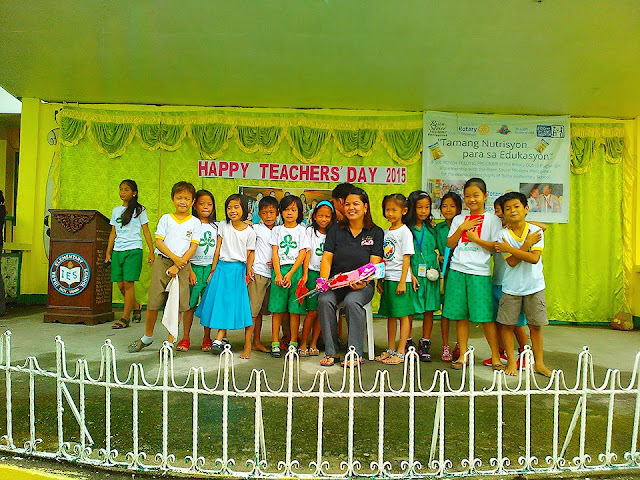 A picture of a teacher receiving symbols of gratitude is indeed an inspiring sight to behold. Across many countries, inside schools, World Teacher's Day 2015 is going to be celebrated with the expected demonstration of thankfulness for those who are tasked with the noble mission of preparing the young for society. This year's celebration of World's Teachers' Day attempts to go much farther than merely acknowledging the vital role played by educators worldwide. The theme for this year is Empowering Teachers: Building Sustainable Societies. What matters to basic education is not what a government legislates, but what a government actually delivers.